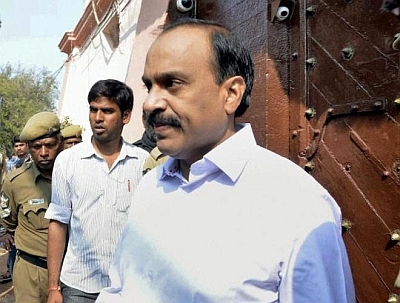 Ballari-based mining baron and former Karnataka minister G Janardhan Reddy was absconding as police were on the lookout for him in connection with a money transaction worth crores of rupees allegedly linked to a ponzi scheme, top officials said on Wednesday. The Central Crime Branch police is also hunting for Reddy’s close aide Ali Khan, who allegedly struck a Rs 20 crore deal with Syed Ahmed Fareed of Ambidant Marketing pvt Ltd, a company accused of involvement in the ponzi scheme, to bail him out from Enforcement Directorate investigation. Bengaluru Police Commissioner T Suneel Kumar said Reddy was absconding and police were looking for him to question him in connection with the case. “Based on the information gathered the investigation is going on further... CCB is after Ali Khan and Janardhan Reddy,” he said. The development comes a day after Reddy’s close confidant Sriramulu’s sister J Shantha, a Bharatiya Janata Party candidate, lost in the bypolls from Ballari Lok Sabha constituency, considered a strong hold of the Reddy brothers. The Congress won the seat breaking BJP’s grip over Ballari since 2004. However, Additional Commissioner of Police (Crime) Alok Kumar said there was no political connection to the probe. He said his team had been working on the case for the last 20 days, but waited till November 3 for the bypolls to be over for further action, so that it was not politicised. Reddy, a minister during the previous BJP rule, had been arrested by the Central Bureau of Investigation in 2011 over alleged multi-crore illegal mining scam and granted bail three years later. Reacting to the latest development, Sriramulu claimed He did not have any information about the case and whereabouts of Reddy, but added and no one was above law. “I don’t have complete information... I have been saying no one is above law. Let law take its own course,” he said. Asked whether Reddy was an accused or a suspect, the police commissioner said, Fareed’s claim is that he paid the money, because he was promised help by Janardhan Reddy in connection with the ED probe and Reddy will have to respond to these claims. “We also have to verify whether it is a fact, whether ED has got any cases registered against Fareed... we have to recover the public money that was part of the transaction,” he added. The commissioner, however, clarified that as of now there was no evidence to prove about Reddy bribing any ED official. Detailing about the case, police said Fareed set up Ambidant around 2017 promising returns of about 40 to 50 per cent for investment. Responding to this, thousands of people invested their money into the company, which initially paid good returns, attracting more and more investors. On the company failing to pay returns as promised, cases were registered against it, officials said, adding that, during January or February ED had also raided it. They said, meanwhile, Fareed had met Reddy through Ali Khan requesting for help in bailing him out of ED the case, and Rs 20 crore was demanded in the form of gold through a jeweller known to them in Ballari. Explaining about the investigation, the Commissioner said, during investigation CCB found a particular transaction of Rs 18 crore being paid by Ambidant to one Ramesh Kothari, who runs Ambika Jewellers in Bengaluru. Kothari on questioning said he had given 57 kg of gold to a jeweller named Ramesh, who runs Raj Mahal Fancy Jewellers in Ballari. Ramesh had claimed thatthe gold was handed over to Reddy’s associate Ali Khan, he said. He said there was no arrest warrant against Reddy, adding that CCB officials have conducted searches at a few places in Bengaluru and Ballari in connection with the case. On reports about Reddy and associates trying to get anticipatory bail in Hyderabad, he said, he got to know about it only through the media. Police said they have photographs of some meetings to prove Reddy’s direct link to this case, about which they will seek clarification from him during investigation. Reddy would soon be issued summons in the course of investigation. Police said they have arrested Ramesh and gathered several ‘crucial’ documents from him. Fareed was also arrested, but currently out on bail.